Written on September 19, 2011 . Posted in Uncategorized. You have arrived at a very special place. Part of what makes this place so special is your arrival. You bring so much with you—your ambition, your talent, your energy, your ideas. You have, after all been selected to be here. But what is most exciting is that when you leave, you will be someone quite different than who you are now. In thinking about today I tried to remember what it was like to be at the beginning of each of my years at RISD —remembering who I was when I sat where you sit now. And what I’ve come to learn in looking back is that this environment, is really about a way to tame curiosity. Why do I say tame? Because we hear what we do referred to as: thinking outside given parameters, about creating new knowledge in the world through making, about breaking down preconceptions, about reconfiguring questions and challenges. But really I think most of us artists, designers and scholars are individuals with an abundance of curiosity. And an education at RISD is a way to tame it, to find a way to push that curiosity with discipline, with focus, with expansiveness, and into the realm of incredible capability. I say tame, because the instincts that incite our work can be quite unruly. We have to coax those instincts into clarity. To find the vocabulary, to find the lines, the forms, the language, that shape what we need to say through our work. What we can only know through the process of making that work. This kind of knowing informs us through our hands, through the actions of our bodies, in making marks and experiences and events, and generating something from deep inside ourselves to live outside of ourselves– getting that idea, interpretation, observation, out in the world in some form or fashion. We generate curiosity by working in realms that are in many cases completely unknown, to feed that intrigue in seeing something that we haven’t seen before that only we can direct or author. Curiosity unbounded is still just curiosity. Curiosity shaped through the forms of practice becomes an expression, a work of art, an event, a piece of writing, a manifested idea. Manifested ideas beget other ideas. And so the process of iteration and commitment begins. The very act of making is a form of commitment. As a teacher over multiple decades, I’ve written a lot of curricula. I’ve often reversed the process of logic, thinking less about how one builds a series of ideas to get to an end, but rather trying to imagine, “where do I want someone to end up?” and then to say, “OK, what are the steps to take to get someone there”? And that’s quite an abstract exercise, when the place that you want someone to get to exists in hypothetical space and in an unknown form. But the nice fact of that abstraction is that even though you don’t know what that thing, that result is, you know intuitively something about where you want the result to be. You may not understand anything about the form or shape of what that unknown work is, but you know very well the way to guide the journey with rigor and high standards. Your gifted RISD faculty members, all stellar practitioners in their respective fields, know how to challenge you. They know how to open doorways that may lead onto paths that hover over deep precipices. But as they give you the nod to walk through, they know how to help you learn to jump over those precipices without falling too far if you misstep. This may sound very unframed as a way to describe an education, but this is part of what RISD faculty do so well, to carefully guide an unknown journey. I’m sure in part, that is why you RISD students selected us as we selected you. I’ve been very fortunate to have had the opportunity to travel to many different parts of the world, and always in connection with my professional work in its many iterations in art and design– jurying competitions, teaching, consulting, lecturing, participating in projects with other artists and designers in other regions. And I’ve seen and experienced moving examples of people generating their creative practice in ways unique to their situation, and to their own curiosity. I remember, for example, in an art center in the middle of a community in the outback in Australia, where as a non-Aboriginal I needed a special permit just to even enter into the “lands”. I watched a women carving into wood, which is something that I do, in my studio sometimes. So I could recognize the impetus that drove her, but the way that she carved was so entirely different from the way that I do. She sat on the ground, legs straight out ahead of her in the dirt, with a large panel of wood on her lap and a small, contained fire next to her. She carved using a long tool made from a straightened metal coat hanger that she had bent at the end to form a parabolic curled hook. She would heat this curl in the fire and then roll it into the wood using all the different parts of its curve to burn lines and shapes producing an astounding array of marks of varying depths. Using this technique she created amazing patterns and images, with an efficiency and speed as if she was breathing rather than carrying out what seemed to me an incredibly difficult and remarkable task. 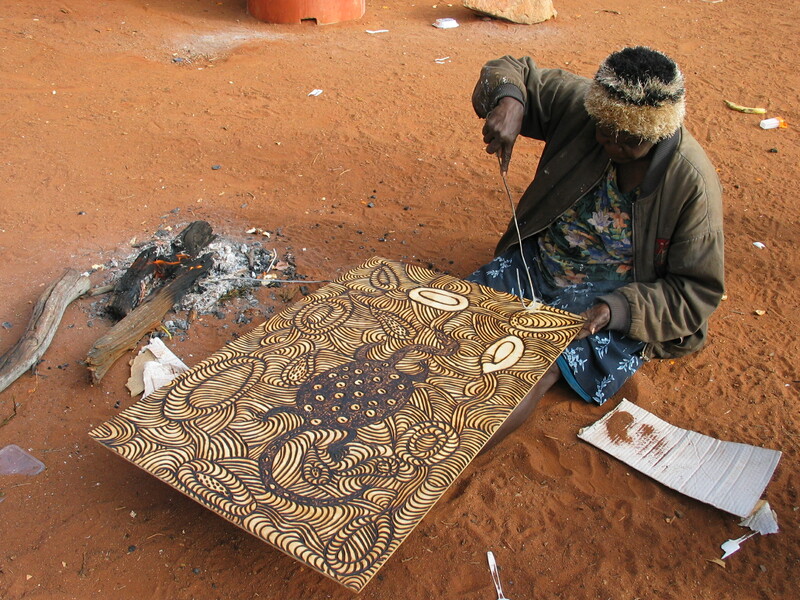 Within two hours, she filled a panel almost the size of her body, with the most intricate patterns of mark making seared into the wood. These were not only beautiful, and a clear demonstration of expert and sophisticated skill, but also produced a result of something more. Her work spoke to content at the core of who she was within her community, within her culture, within her spiritual lineage with her ancestors. Though her own interpretation, one deeply rooted in the value system that spoke her thoughts and beliefs. And while I watched her I felt an incredible simpatico sensation with the process that directed her in making her work and that which I use in making mine. Even though she sat connected to the ground, with her outstretched legs as her workbench, and I work in an old industrial mill building and sit in a beautifully outfitted studio full of tools, equipment, and machinery. I thought about the processes that she uses to make her work, and the processes that I use to make mine. My connected feeling wasn’t about what was same or different about us. It was just about a way of knowing that we shared. Of course she didn’t know what I do, or how I do it, so maybe it wasn’t really sharing, for me perhaps it was simply a form of recognition. But as I watched her work, I realized that there is something that drives all of us as makers, as people pulling that core thing inside that we have a need to bring into the outside world, that we share as a way to express our own curiosity. And I realized that those of us who experience this way to tame our curiosity have no choice but to make our work, in whatever form that takes. I know RISD from many perspectives. I have been a student, an alum, a part-time faculty member, a full-time faculty member, a graduate program director, a department head, a parent to a pre-college student, a CE student myself, an artist in our museum collection, an Associate Provost and now interim Provost. So I believe I have some authenticity when I say that I have a valid sense of what waits in front of you as you start your new year at RISD. Before you sits the promise of time that will go so fast that you can’t imagine, but at times will feel painfully, and I mean e x c r u c i a t i n g l y, slow. And time that will forever mark who you are and who you will become. Throughout this unique pattern of velocity, you will be fighting against that curiosity driver that teases you as it hides and then reappears and then ducks back out of sight. And somewhere along the way you will find the language and the tools to push open the window that frees the results of your curiosity so that it lives proudly and significantly in the world. We live in a time where our creative curiosity is more valuable than perhaps at any other moment. By residing in the haptic, the experiential, the physical, and by utilizing the hands as portals of intelligent learning– a RISD education offers unique and privileged forms of development that create a rare form of intelligence. Fields that have never looked to art and design to inform them are increasingly curious about how our developed minds can teach them something from the vantage point of our areas of developed expertise. Some of you will manifest your curiosity in ways that integrate your work in these contexts. Others will create services that help people to live more humane lives, or things that we wear, sleep in, eat off of, live in, live with, and experience that make our lives more efficient and elegant. That honor and protect the environment. That help our growing elderly population. That redefine a society interfacing with new technology faster than we can culturally assimilate the why’s and how’s of this massive shift. Some of you will produce works of art and writing and create events and experiences that will transform the way we think, will question the things that we assume, will challenge how we understand each other, and even how we think we know ourselves. What is so unique and incredible about RISD, is that the mass of that work and energy will be developing around us all. Each of you will honor our desire to shape a future that we mark with our fingerprints. So, a little advice as you embark on the incredible year that lies before you at this extraordinary place: feed that curiosity. It gets hungry. Give it the food of friendships, of visits to the diverse communities of a complex city beyond the college streets of the east side. Discover the ghosts that hide in the beautiful architecture of the towns of RI, the spectacular empty beaches of New England autumns, the places to find the best breads in the city and the best ice cream in the surrounding towns! Eat a stuffie or a johnnycake with a side of coffee milk! Save time to treasure the very special access that you have here to tens of thousands of objects in our Museum that are here explicitly for you to learn from and to know in person. Look through the bugs and shells and skeletons in our Nature Lab. In what other art school can you check out a scorpion like a book? Read in our Library. Shop for things there you’ve never seen before in the open stacks of the best art and design library in the world. These resources are gifts unparalleled in any other art school in the country. Use them! Manage your studio time so that you can attend that lecture that you know you want to go to but that you can’t because you have a project due tomorrow. Discipline is half of what will allow you to take in the many extraordinary events and opportunities that will challenge your schedule throughout the year. Cook a meal with friends and take the time to eat it slowly. Spend time to develop those friendships that I can promise you, will form the basis for lifelong friends and professional colleagues. Get off the Internet! Exercise. Breathe. Sleep. Feeding your curiosity will help it to nourish and grow, and through that evolution your many iterative projects and triumphs and even more importantly your failures, will coax it into finding its best language. Your teachers and your peers will help you to learn how to launch your spectacular results into the world in a way that only you can. And at some point, perhaps if you haven’t already, you will find that sense of simpatico, with your colleagues, or with other artists somewhere in the world that also possess this kind of knowing. And you will share the fruits of this with those who perhaps aren’t as lucky as we are to have a way to turn our deepest beliefs into manifested works in the world. Be good to each other, be good to yourselves and have a great year!